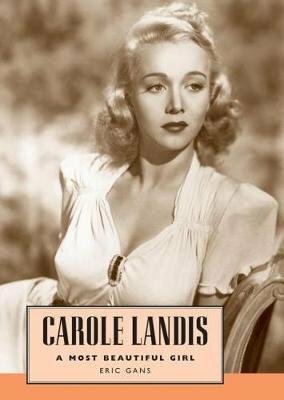 Despite appearing in twenty-eight movies in little over a decade, Carole Landis (1919-1948) never quite became the major Hollywood star her onscreen presence should have afforded her. Although she acted in such enduring films as A Scandal in Paris and Moon over Miami, she was most often relegated to supporting roles. Even when she played the major role in a feature, as she did in The Powers Girl and the film noir I Wake Up Screaming!, she was billed second or third behind other actors. This biography traces Landis's life, chronicling her beginnings as a dance hall entertainer in San Francisco, her career in Hollywood and abroad, her USO performances, and ultimately her suicide. Using interviews with actors who worked with Landis, contemporary movie magazines and journals, and correspondence, biographer Eric Gans reveals a tragic figure whose life was all too brief. Landis's big break came in 1940 with Hal Roach's One Million B.C. She appeared in thirteen Twentieth Century-Fox pictures between 1941 and 1946. In 1942-43, Landis entertained troops in England and North Africa in the only all-female USO tour. The trip led to her memoir, Four Jills in a Jeep, and a Fox movie of the same title. After her last American film in 1947, she completed two projects in England while having an affair with married actor Rex Harrison. Tormented by a love that could not lead to matrimony and depressed about growing older, she took a fatal drug overdose on July 5, 1948.